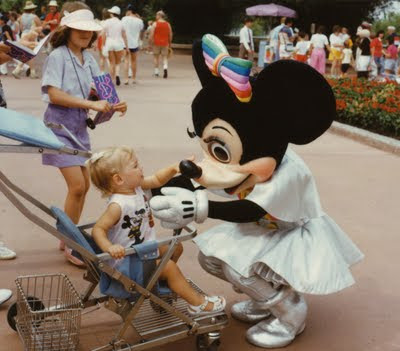 I wonder if these costumes are somewhere in backstage Epcot? The perm is my Mom, the kid my sister, and the barely visible Goofy hat is yours truly. 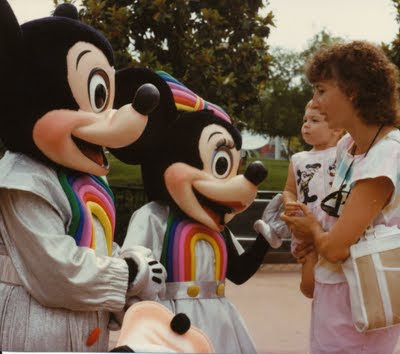 Wow, I forgot about these rainbow outfits. I think they might have had the same outfits in Anaheim for a short time....possibly at the dedication of Captain EO or Star Tours. Do you still have the Goofy hat? I still have the hat, I think it's in my Mom's attic. I have a picture of my sister and I with Mickey and Minnie and Pluto all dressed up this way!